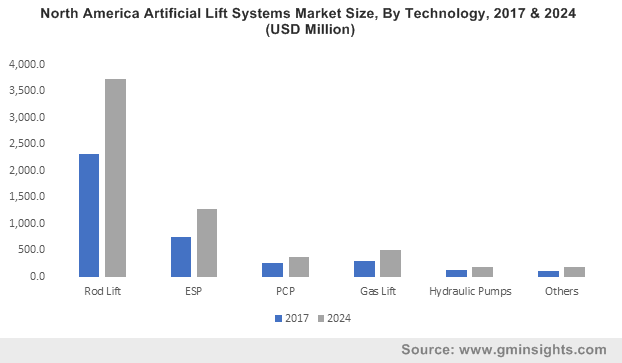 Artificial Lift Systems Market size in 2017 was valued over USD 8 billion and is predicted to expand over 6% by 2024. Shifting trends toward unconventional wells coupled with increasing number of mature fields will drive the market size. Mature wells account for over 70% of the total oil & gas production, with several fields in secondary or tertiary phases. In 2017, Schlumberger designed a workflow to maximize artificial lift performance and reliability which was implemented in a mature field in Latin America, as the centrepiece of a strategy to reactivate 10 abandoned wells. Growing investments toward technological advancement to improve efficiency across the complete spectrum of E&P technology will propel the market growth. Recent innovations including real time monitoring, smart alarms, and retrofit capability will positively influence the industry growth. Development of multiphase gas handling pump for the continuous operation of ALS systems will further escalate the product adoption. Ongoing government plans and strategies to increase crude oil production will positively impact the ALS market share. In 2015, the Government of UAE announced plans to enhance its oil production to 30% by 2020. Growing demand for petroleum product coupled with positive outlook towards low cost oil production will further enhance the business growth. Rod lift ALS market is anticipated to witness growth on account of its simple design, easy operability, and low operating cost. Moreover, high efficiency of about 50 to 60% coupled with the ability to lift high-temperature oil will further complement the business landscape. Relatively inexpensive installation cost, long life, and availability of different sizes are the key parameters which will stimulate the product penetration. PCP in 2016, held over 8% of the global market share. Ability to provide accurate metering, minimal backflow and enhanced suction performance will fuel the industry growth. These systems are suitable for pressure of up to 80 bars, making it appropriate for high pressure wells. 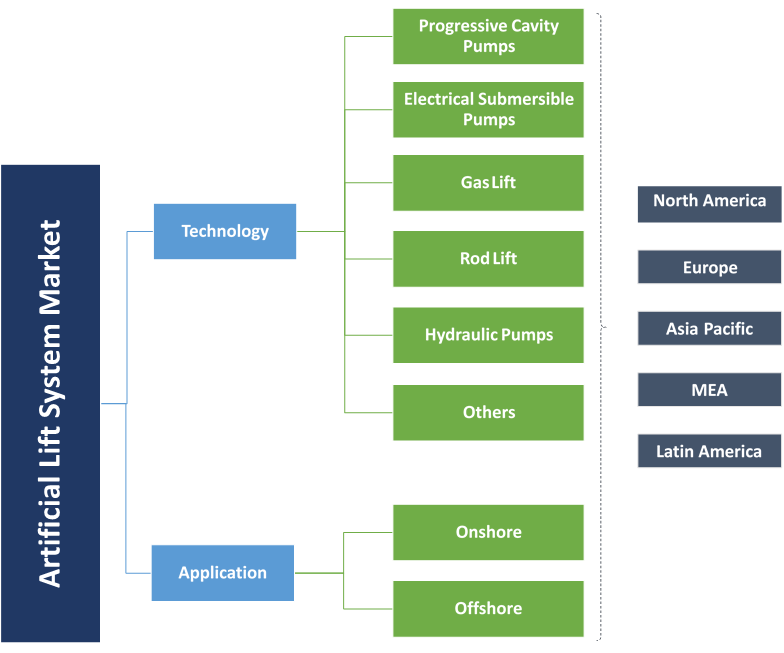 Electric submersible pump market will expand owing to its effective corrosion handling capacity, smaller surface footprint requirement, and ability to operate pump intake pressure of less than 1 MPa. Operators’ efforts to deploy or retrieve ESP assembly in lesser time with minimized production losses will enhance its adoption over its available counterparts. Onshore artificial lift systems market size is projected to witness gain over 6% by 2024. Growing focus toward heavy oil reservoirs coupled with increasing number of ageing fields will propel the business growth. In 2017, World Oil reported a 25% increase in onshore wells drilled in Brazil when compared to 251 wells in 2016. Shifting trends toward offshore field production owing to the economic benefits and availability of resources will foster the offshore artificial lift systems market. In 2018, Petrobras announced its plan to drill around 29 exploratory wells every year by 2020, which is nearly double the number of wells drilled in 2017. The U.S. market is projected to witness substantial growth owing to the existence of low pressure oil wells coupled with continual increase in oil consumption. As per one of the industry giant, the U.S. crude oil consumption increased from 18.5 MMbbl/d in 2012 to 19.6 MMbbl/d in 2016. Availability of untapped reserves in the country will further complement the business growth. UK market will grow on account of increasing oil production coupled with ongoing field development plans. For instance, the UK operators have approved various field development plans in 2016 and 2017, which are expected to begin production by 2024. Availability of proven oil reservoirs along with escalating focus toward mature fields will foster the Saudi Arabia market. Huge investments across the upstream sector along with increasing O&G production and consumption will further complement the business landscape. For instance, Saudi Aramco has proposed plans to conduct additional drilling at the existing fields to help compensate for the natural decline from the mature fields. Eminent industry players across the artificial lift systems market include General Electric, Schlumberger, Halliburton, Weatherford, Borets, National Oilwell Varco, JJ Tech, Dover Corporation, Aker Solutions, NOVOMET, BCP Group, and Occidental Petroleum. Industry players are focusing toward inorganic growth ventures to expand their business presence. In July 2017, Halliburton acquired Summit ESP to expand its existing artificial lift capabilities and strengthen its position in North America oilfield services. ALS is a means to overcome bottom hole pressure in order to produce oil or gas at desired rate, either by using a downhole pump to offer additional lift pressure downhole or by injecting gas in the producing fluid column to decrease its hydrostatic pressure. The system finds major applications across mature or depleted fields which can no longer produce under its natural energy. ALS is also deployed in new fields or reservoir in its secondary phase to improve project economics and increase production rate.